Savoring the Delights: THM Basic Cheesecake with strawberry swirls. 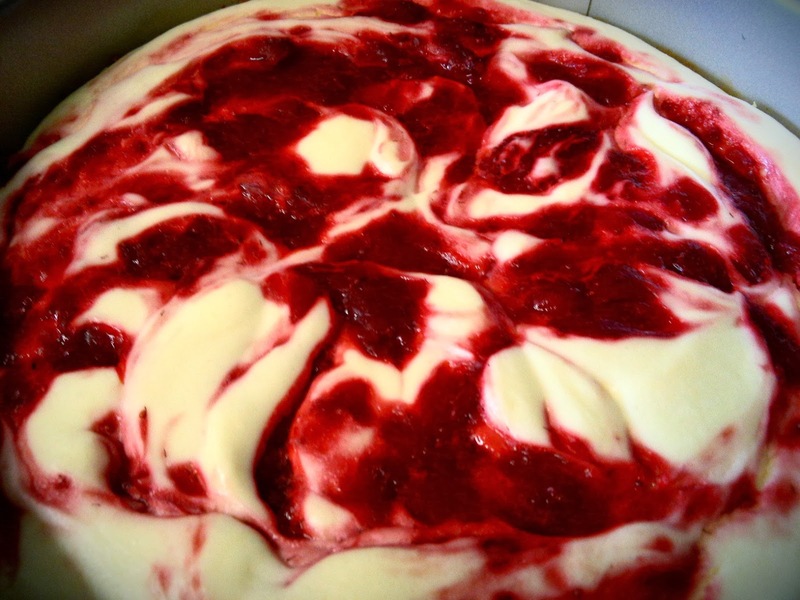 Basic Cheesecake P373 of the Trim Healthy Mama Book. I just reduced some strawberries on the stove with a splash of lemon, a whisper of gluccie, and a skimp of KAL pure stevia. I made a jar of this while I was at it. Basically, the Slim Belly Jelly, but I didn't add water since for this I didn't want it diluted. I glopped about 5 or 6 tablespoons heaped here and there then gave it a quick swirl with a knife before baking. For the crust, I like to just sprinkle some ground almonds (with a few chunks left) onto the bottom of the pan. I baked it at 300° instead of 350° since I feel cheesecakes bakes nicer at a lower temp.